I barely followed last week's menu plan. The leftover nights went as planned, but I either changed the new meals that needed to be prepared or skipped those cooking nights completely by using up more leftovers. We even broke down and had take out on Friday night! I don't even feel guilty about the take out, since it's usually our tradition to order Chinese Food on the weekend of special occasions. In this case, we would have ordered Chinese on Saturday, but after a particularly sleepless night due to Grace, I was in no mood to plan Friday night's dinner! On Sunday, we did a large shopping order. We were in a hurry and didn't manage to pick up everything we needed since we were in a new store and didn't know where to find everything. We did get a bunch of fresh veggies, some meats and diapering supplies. We still need some canned and frozen items to hold us over until it's time to fully re-stock our pantry in a couple of months. After my almost non-cooking week, I'm ready to try some new recipes! Packer Country Soup Recipe. I found this recipe via Pinterest sometime last week. Since we're just about chickened out, we're in the mood for some red meat recipes! Although we splurged and bought the meat when it wasn't on sale, I'm sure we'll get a few nights from this recipe. Cauliflower Potato Soup. I've been in the mood for my Mashed Potato and Cauliflower Soup, but I don't have any leftover Mashed Potatoes with Cauliflower. Again, Pinterest saves the day by allowing me to find this yummy looking soup recipe! Pasta with Easy Bacon Tomato Sauce. This will most likely be our Valentine's Day meal. It's easy but seems special enough for a holiday dinner. Plus, it's one of our favorites! I was hoping to pair it with these Fresh Mozzarella Bites shared at Pocket Change Gourmet, but Joe caught me when I tried to sneak the $6 container of fresh mozzarella into our shopping cart. Boo! Hoping that goes on sale soon because I really want to try that recipe! Mini Barbecue Meatloaves. Although the chuck steak that we bought this week wasn't on sale, I did find a big pack of ground beef on Manager's Special. 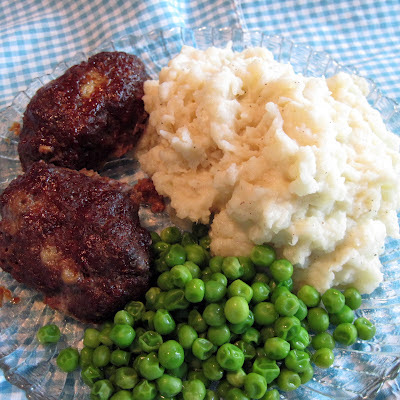 Meat Loaf is one of our favorite comfort foods, but since we eat so much chicken and soups, it only makes the menu plan a couple times a year. I can't decide if we should have mashed potatoes or buttered noodles with our mini meatloaves. BBQ Bacon Spaghetti Squash with Carmelized Onions. I never did get to Debbi's recipe last week. Mainly, because we didn't have the spaghetti squash. Even though, I didn't do much cooking last week, I like to think that if I had the spaghetti squash, I would have made this! Lentil Soup with Beef. I don't get the opportunity to watch cooking shows too often anymore. A few weeks ago, I had the chance to watch some reruns while Grace napped. This Giada Di Lauretiis recipe has been on my mind ever since! I've made Lentil Soups before and while I enjoy them, Joe's never really been on board with the idea. I'm thinking the beef added to this recipe will be a winner! Now that you know what we'll be eating this week, share your dinner plans in the comments or follow me over to Menu Plan Monday for more recipes and menu planning inspiration. Also, if you like what you see here, check out my past menu plans! Finding new recipes on Pinterest is so much fun. A lot of my recipes this week came from Pinterest too. 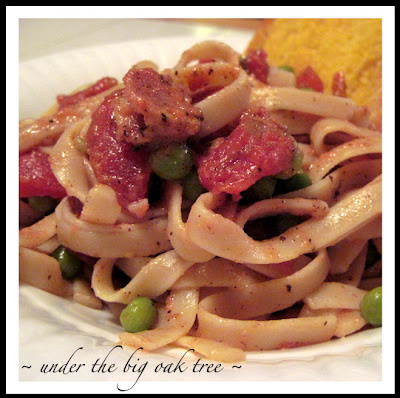 The bacon tomato pasta sauce sounds delicious!